Do you dream of having your own little homestead no matter where you live? These 7 essentials for a backyard chicken coop will have you well on your way to your own little piece of self sustainability. Today is a guest post from Jayden Copeland over at Back Road Bloom. Jayden writes about everyday homemaking and country living, which you all know is right up my alley! She has put this entire guide into a beautiful ebook, and is offering it for FREE. Be sure to go download your copy HERE. 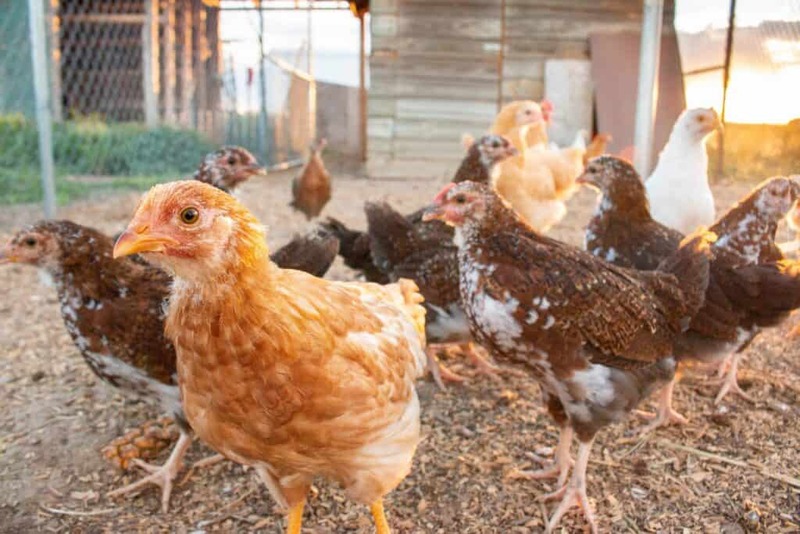 If you are considering taking the leap in raising backyard chickens, there are a few things you should take into account before you get started. There are a WIDE variety of backyard chicken coop ideas and resources available. You can build your own coop from scratch, purchase a pre-made coop from the store or online, or you could turn a building or structure you already have into your very own backyard chicken coop. Whatever you choose to do, there are some necessities that you should make sure your coop setup has. I do want to preface this by saying that I am using the word necessities lightly! Of course, you really could just throw a few chickens in your backyard or outdoor barn, make sure they have some sort of food, water, and shelter, and call it good. In reality though, your chickens wouldn’t be very happy, you’d be hunting for eggs like its Easter, and they may end up prey to some sort of predator. There is a strategic way for you to set up your coop and their living area in order for you to have an optimal, egg-laying squad of chickens and a happy, egg harvester. 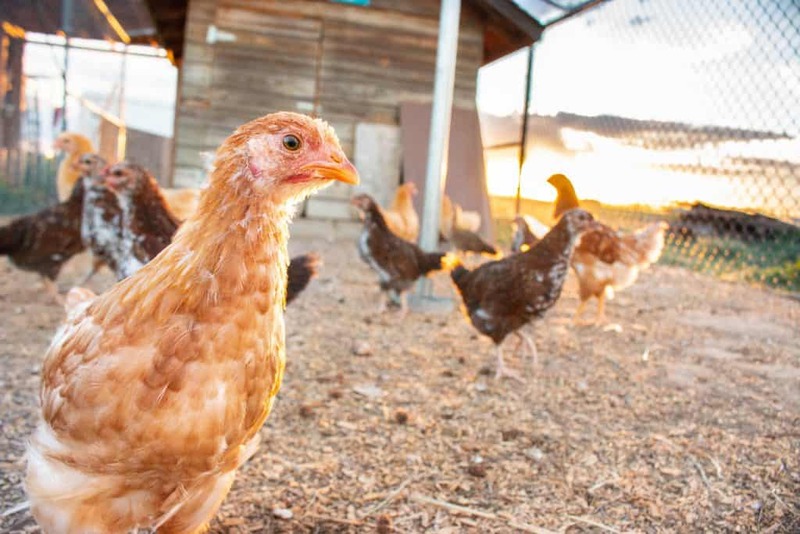 These seven essentials are really what you need to make your chicken raising experience the easiest and happiest it can be for both you and your birds. Just like with the different varieties of chicken coops, these necessities can be made or handled in a variety of ways. Get creative and do what works for you! 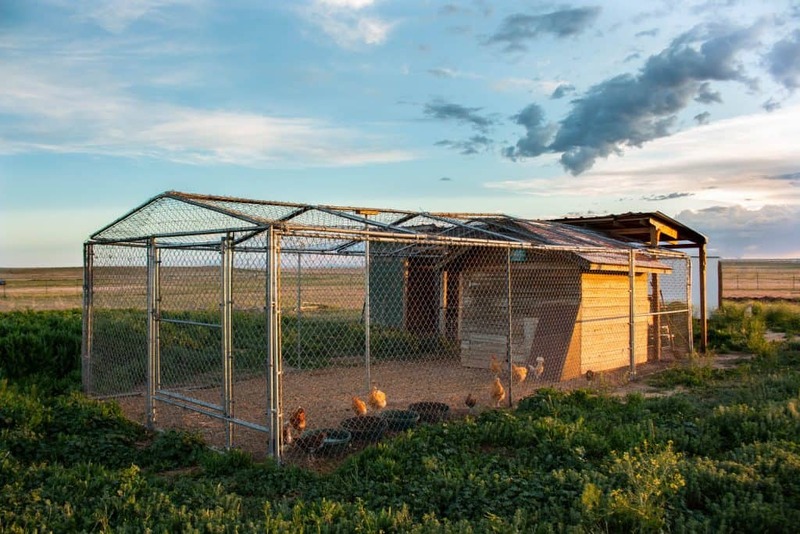 Your outdoor space or run could include using a transportable coop that allows you to move the chickens to different areas of land as their feed supply is used up. Your enclosure could be made from chicken wire or from fencing. Bedding could be sand, dried leaves, straw, etc. Use what works for and your space and whats in your budget. Simply use the tips described in the following pages as a guideline! Inside your chicken coop, you will want to make sure that you have enough room for roosts, nesting boxes, and food and water, which will all be described in more detail below. The most important thing to take into account is how many birds you plan on having, and how much space they will need. Usually the chickens will only be inside the coop in the evenings or if the weather is harsh. You should also consider the possibility of flock expansion in the future. Another thing to think about is storage space, if you are planning on keeping feed buckets or any cleaning tools inside of the coop, plan for extra space. Chickens love to forage and roam free, so providing them with enough outdoor space to do so is also essential in raising a healthy flock! The more space you can give them, the better. As with any animal if they are tightly confined it can lead to a greater chance of disease and health issues. 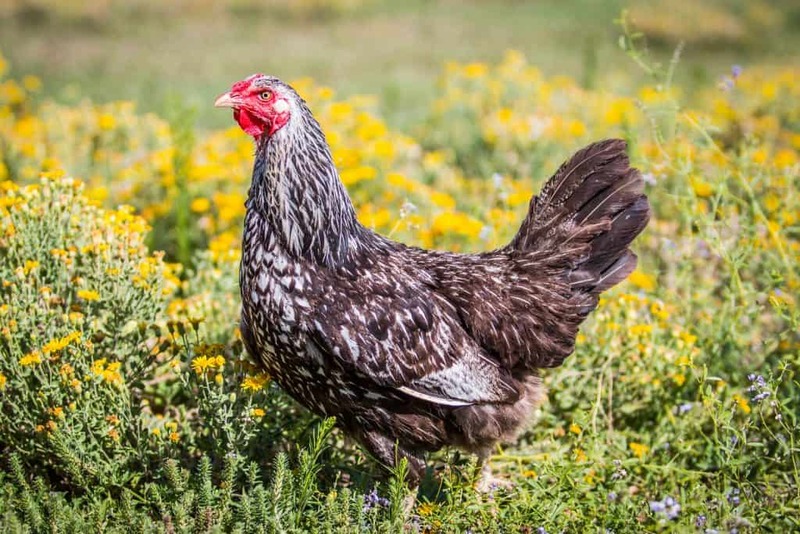 If you have ever been around chickens, then you will know how much they like to roam around and peck at the ground, searching for bugs, plants and small animals to snack on. If you are able to, allowing the chickens to roam completely free, around your farm, homestead, or yard, for a portion of the day can be a great option. They can be free to forage during the day and then closed in their coop/run in the evenings to protect them against predators. Side note, who doesn’t love to see chickens wandering around?! The epitome of a beautiful country scene! Even with free range chickens, an enclosed run will usually be the best protection against predators and/or weather. Some predators will come from above, think hawks and other birds, or below with digging: coyotes, raccoons, etc. Take into account what animals may be in your area that might view your chickens as a quick dinner, and try to develop a run that will protect them from those animals. As seen in the pictures here, a chain link fence can be a great option for an enclosed run. Other options include chicken wire, hardware cloth, corrugated plastic, etc. Again, think about what predators there may be; if you have predators that could dig under the fencing you will likely need to bury your fencing extra deep. When chicken manure piles up, it can create an ammonia build up, which can be a health hazard to you and your chickens. Moisture from snow or rain can also cause a musty and mildew prone atmosphere. Prevent this by making sure your coop has proper ventilation through doors or windows. You could also install vents in the walls of your coop. If the weather permits, try to simply keep a door or window open as often as possible. The fresh air will keep the coop from having any kind of toxic build up, and will help with the smell of manure. When you’re planning your backyard chicken coop, the flooring and bedding will both play a role in the ability to clean the coop as well as in the health of the chickens. For obvious reasons, a concrete or wood flooring can be easier to clean, but dirt flooring will work just as well if that’s your only option. Adding bedding is an important step to help keep the coop cleaner, warmer, and make the manure removal easier. Depending on where you live, bedding can be extremely helpful in keeping the chickens and the coop warm and dry during the harsher months. If you have ever had any experience with gardening and in particular composting, you will know that different materials as they start to compost can generate a great deal of heat. The idea with using these types of materials as bedding is that the bedding will naturally generate heat to keep the coop and the chickens warmer. This is sometimes referred to as the ‘deep litter method’. So, if you live in a climate where the winters are extra cold or wet, the ‘deep litter method may be for you. 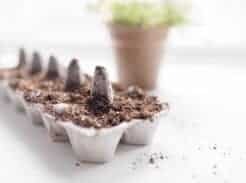 As a plus, you could use the generated composted material in your garden come springtime! Some different bedding materials that can be used in your backyard chicken coop will include: straw or hay, dried leaves or grass, wood shavings, and sand. Cleaning and replacing the bedding on a regular basis will keep the coop clean and make for a healthier environment for your chickens. A space for the chickens to lay their eggs is not only helpful to them, it will make things much easier for you as you will know exactly where to search for the eggs when they start laying. If you don’t provide them with nesting boxes, they may lay their eggs in difficult to find or get to spaces. Chickens prefer a private nesting area, so if they are nesting somewhere you don’t know about you will probably have a difficult time finding it! Hence, the nesting boxes, which is just a small box designated for egg laying. One nesting box per every 4-5 hens should be sufficient. Hens prefer a covered and dark area to lay their eggs. A deep pitched roof should discourage the hens from nesting or roosting on top of the box. We will talk about roosting next! Adding some of the bedding that is used on the floor to the bottom of the nesting boxes is also a great idea. Some different options for nesting boxes will include homemade wood boxes, buckets, milk crates, etc. Again, utilize what you may already have on hand and do what works for you and your space. In the evenings when chickens are ready to sleep, they prefer to roost, or sleep, up off of the ground. Therefore, a roost is just a place for them to perch on to sleep, think about different birds roosting on branches in a tree. This is because chickens are following their intuition to seek higher ground that is away from any potential predators. Roosting also allows them to keep away from any manure, insects, and junk that may be on the floor, allowing them to stay dry and healthy. Providing them with roosts to perch on and sleep on in the evenings is essential. Its usually recommended that you have at least 8 inches long by 2 inches wide of roost area per chicken. A few simple 2 x 4 boards will usually do the trick! In addition you will want to have enough space between each roosting board so that the chickens are not crowded on top of one another. Don’t make the boards too high to where the chickens will not be able to get up to them. Depending on the breed and size of the chickens, some will be able to fly higher than others so just be sure your roosts will work for your breed of chicken. For the most part though this shouldn’t be too big of an issue. For obvious reasons, one of the most important components of a backyard chicken coop is some sort of feed and water sources for the birds. Again, there are a variety of different options for feeders and waterers. Its helpful if you can keep your feeders off the ground, as it will provide the hens with more space for scratching and foraging. You can purchase a feeder and waterer at your local hardware store or ranch and supply store. There are also a plethora of options and tutorials for making your own. Some chicken owners will find that different feeders are more wasteful than others, as the chickens spill the feed easily and then don’t eat it. Something to think about! In addition, something you may want to look into is what kind of feed you are going to be giving your chickens. Chickens will eat a great deal of kitchen scraps (though some things you should refrain from feeding them) so scraps can be a wonderful supplement to their diet. There are also many different feeds available, organic, non-GMO, etc. and even resources for making your own homemade chicken feed. With a little research you should be able to find an option will work best for you. 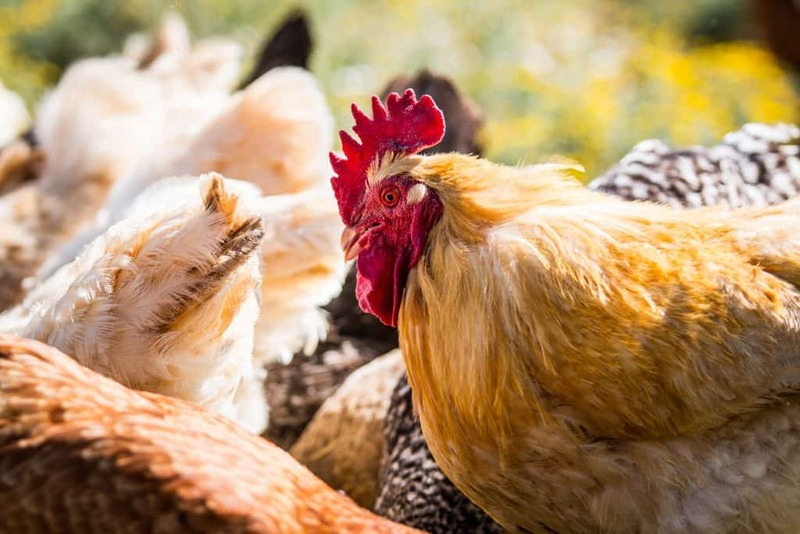 Hopefully these tips on the 7 essentials for a backyard chicken coop will get you headed in the right direction towards raising your own flock of chickens. There aren’t any strict rules with how you should handle your backyard chickens, but I am confident that if you pay mind to these seven necessities you will be on your way to chicken, farmer, and egg heaven in no time. Thank you so much for following along! 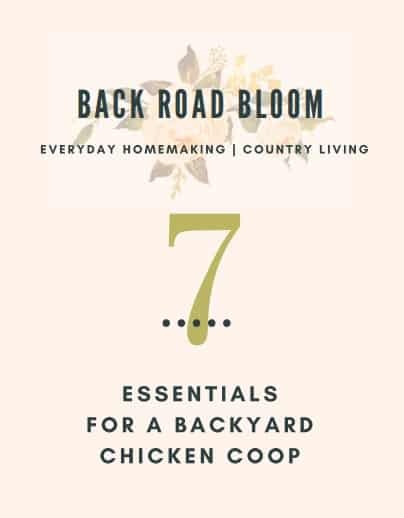 For more country living tips as well as homemaking advice, check out the blog Back Road Bloom.